The new year kicked off with more gloomy news for retailers. Many were quick to point the finger at ecommerce titan Amazon for monopolising shopper attention, squeezing margins and driving historic brands into irrelevance. 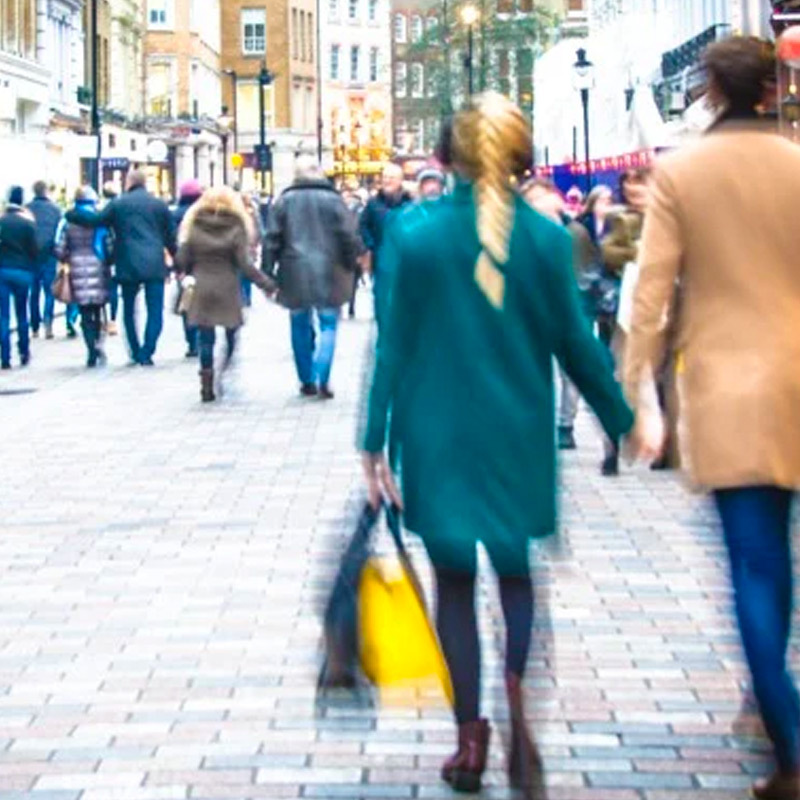 Although Amazon has driven consumer expectations ever higher, is it really to blame for profit warnings at high street fixtures such as Marks & Spencer, Debenhams and Mothercare? Surely its success does not mean shopkeepers should pull down their shutters once and for all? At Great State, we like to look behind the headlines. 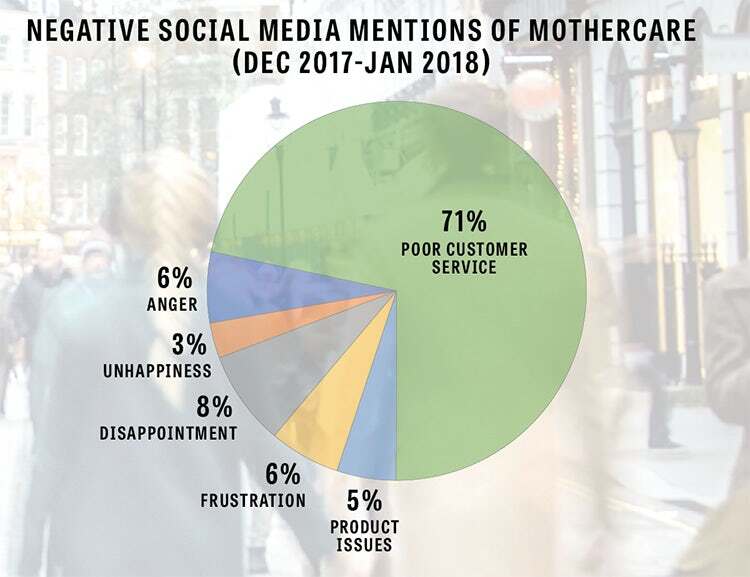 So, to understand how retailers need to improve their customer experience in order to better compete, we analysed one poor performer: Mothercare. Mothercare’s like-for-like sales fell by 7% during the Christmas period. Profits are expected to be down by between 75% and 95% (to £1m to £5m) and the company’s share price has already halved in the past 12 months. But it is not all Amazon’s fault. Mothercare is not providing the products, experiences or services that meet the needs of today’s parents. Our online analysis shows that the balance of conversation around the brand turned from positive to negative over the course of 2017. It should not have taken a particularly painful Christmas period for management and shareholders to start taking note. Mothercare’s website and app are difficult to navigate. (“I don’t understand why they have the refine feature when it doesn’t work,” says one user review). The site also lacks any live chat option – a feature that can help customers and drive conversion. All of this means that shoppers actually find it easier to buy Mothercare products on Amazon (where margins are slimmer) than on the brand’s own site – placing Mothercare in a far more competitive context where customers can easily be swayed to buy from a rival. Our research also reveals that Mothercare has to contend with tired physical stores and a fulfilment system that frequently fails to deliver (literally), all of which is alienating and frustrating parents – an audience whose emotions are often already running high. When things do go wrong, Mothercare’s customer service team is failing to resolve issues quickly. In the past year, over half of negative mentions specifically bemoaned poor service and time wasted, and over 20% of these mentions expressed emotions such as anger or disappointment. It is difficult to imagine even the strongest of brands weathering such chaotic standards of customer service and experience. Unfortunately for Mothercare, its brand inspires mild enthusiasm at best. 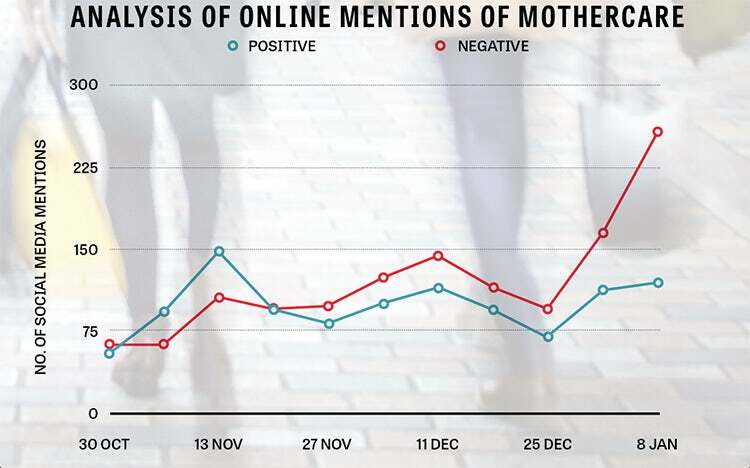 Given the nature of the audience – a highly vocal online community of parents and parents-to-be – we had expected to see lots of brand advocacy and positive sentiment. However, the opposite is true: 20% of all mentions are negative and customers have given the retailer a Trustpilot rating of just 1. Take one look at the maternity wear provided by Asos and it is easy to see why its customers continue to shop with it when they are pregnant: there is more choice, more appealing products and an easier to use online experience. Throw into the mix innovators such as Vigga – where parents lease clothing for a monthly fee and can swap for bigger sizes – and it feels like Mothercare is behind the times. Mothercare is modernising its shops. Those that have been refitted are making an impact and, according to its latest trading update, two-fifths of digital sales now come from iPad purchases made in store. House labels MyK (designed by Myleene Klass) and Little Bird (designed by Jools Oliver) are driving conversation from parents who want their children to wear clothing that is more stylish or even gender-neutral. However, although the brand has a wealth of high-quality, helpful content on its YouTube channel, there is still no Alexa or other voice ‘skill’ for parents who might have their hands full. While Mothercare is taking some of the right steps to turn things around, the question remains as to whether it can make changes quickly enough to keep up with demanding consumers – before it is too late. Our analysis suggests Mothercare is facing serious challenges – not just from increased online competition, but from its failure to listen and respond to the changing needs and expectations of its core audience. There is no question Amazon is disrupting the way we shop, but this does not have to mean the inevitable death of the high street. At Great State we know these challenges are not solved by the silver bullet of a new campaign or an updated app – but by forensically examining the entire customer experience.